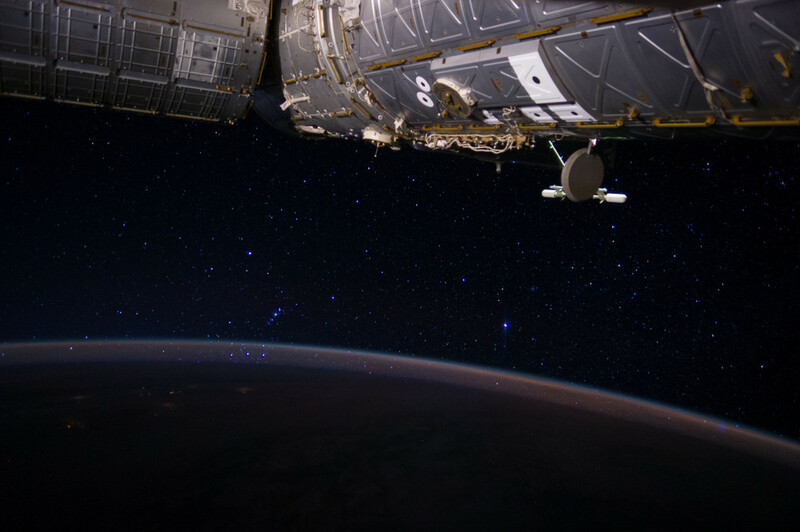 Explanation: Orion's belt runs just along the horizon, seen through Earth's atmosphere and rising in this starry snapshot from low Earth orbit on board the International Space Station. The belt stars, Alnitak, Alnilam, and Mintaka run right to left and Orion's sword, home to the great Orion Nebula, hangs above his belt, an orientation unfamiliar to denizens of the planet's northern hemisphere. That puts bright star Rigel, at the foot of Orion, still higher above Orion's belt. Of course the brightest celestial beacon in the frame is Sirius, alpha star of the constellation Canis Major. The station's Destiny Laboratory module is in the foreground at the top right.